Transform, recuperate and adapt an historical building without spoiling the architectonic design, taking at the same time into account the building techniques of the period in which it was build having to use modern and trustworthy materials, is not easy. We are talking about a Marquis de Pombal style building with architectonic characteristics of that period, with many upper floor structures supported by the walls of the down floor constituted by essentially wooden partition walls Marquis de Pombal style wooden frameworks. The works were carried out on a second floor. 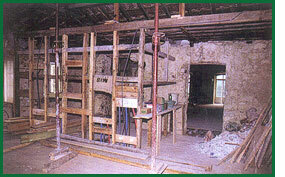 Several fragile spots had to be taken into account from the very beginning, since the floor had to be subject to some risk works, mainly those related to the removal of walls and other floor supports of the upper floor, that at the time was supported by wooden beams and some scaffolding boards. It was therefore necessary to guarantee some kind of security applying metallic beams and other reinforcement structures that allowed us to start the works. The rooms were newly dimensioned and new walls were built inside the house. The electric, water and sewage systems were replaced and installed according to the legislation in force and then we did the finish and painted. When we started the works we found an open space to the left and to the right on the second floor, since all partition elements had been removed. These elements, in this kind of construction have the role of supporting the upper floors so the whole building was at risk of collapsing. The damage and pathologies were so serious that the insurance company refused to do specific civil responsibility insurance for the work. 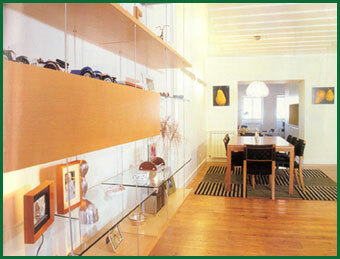 We accepted the challenge and the work were just insured by the company's general insurance. We created a more resistant structure with metallic beams to support the upper floors, so the works could be carried out with lesser risks and safely. Afterwards the still existing walls were examined and a plan with the location of the walls of the closest floors was made to evaluate the location of the strength lines that guaranteed the building security in order to be able to better define the way of individualizing the second floor spaces. One of the important aspects was the need of building the living room ceiling so as distribute the weight by the walls with no central support obtaining thus a wide space in the dining room. Fragments of dry mortar and plaster were cleaned to alleviate unnecessary weights and make it easier to work. "Bricolage e Decoração" Magazine - Photographs by Sara Matos e David Aço.